An Egyptian obelisk is a four-sided monolith made from a block of stone that tapers toward its peak. 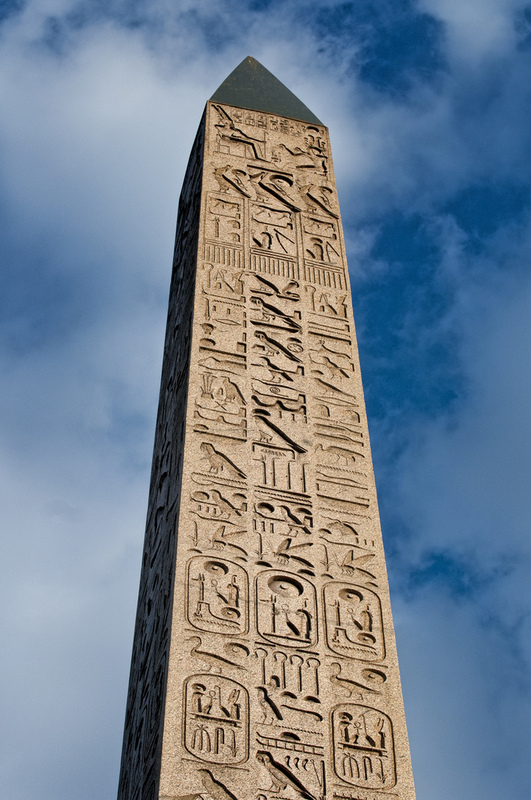 The actual word for obelisk in the ancient Egyptian language is tejen. Like the term “pyramid,” the term “obelisk” is derived from the Greek. Obelískos is the diminutive form of obelós, a pointed column or mast. Obelisks are crowned with a familiar Egyptian structure—a small pyramid called a benben by the Egyptians. The obelisk and larger pyramids share the same symbolism in Egyptian cosmology. Both are stylized representations of the primeval hill from Egyptian mythology, one which arose during the birth of the world—a time before anything existed, including gods and mortal beings. This legend was developed in the ancient city known as Onu (later named Heliopolis by the Greeks) where the sun, in the form of Ra, and the benben stone had been worshipped since Egypt’s Early Dynastic period (circa 2950-2575). Some scholars theorize that the original benben stone may have been a meteorite and was considered sacred because it came from the sky, the realm of the gods. 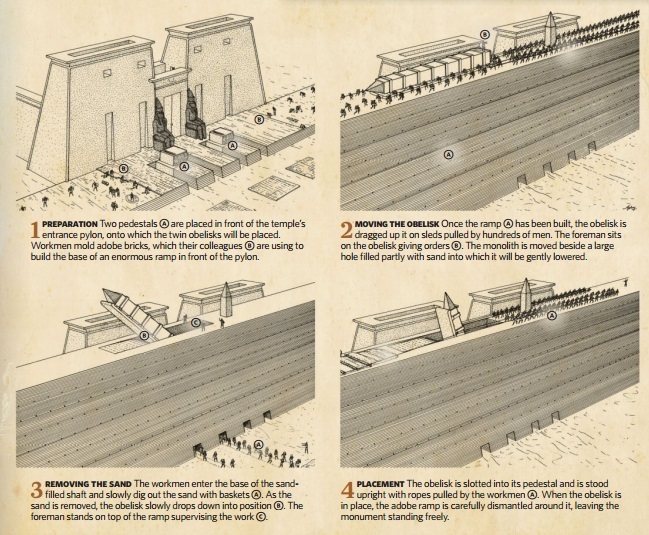 The Pyramid Texts, a series of prayers and spells from the Old Kingdom (circa 2575-2150 B.C. ), were found in 5th and 6th dynasty pyramids at Saqqara near Memphis. In the writings, the hieroglyph representing the benben is a complete or truncated small pyramid, a double or single staircase, or a hill with a rounded edge. In all these cases, it depicts something that rises from the earth to the heavens and connects the two worlds. The benben also symbolizes the process whereby sunlight falls to the earth and gives life. That is why solar symbols and figures of the king protected by the sun god Ra or Amun-Ra were inscribed on them. Obelisks are a constant throughout the history of Egypt, built from the Old Kingdom to the Roman conquest. But during this vast period of time they underwent considerable evolution. In the third millennium B.C. the 5th-dynasty pharaohs Userkaf and Neusrrre built sun temples at Abu-sir, the necropolis at Memphis. These buildings are not strictly obelisks, but they can be seen as their prototypes: They have very similar shape, though they are not so slender, and instead of being made from a single block of stone, they were built from blocks clad with white limestone. Later, in the 6th dynasty, Pharaoh Teti ordered the construction of a small obelisk in the Heliopolis temple, some 10 feet high. Pepi I decorated the pyramid of his wife Queen Inenek-Inti with an obelisk. The 9th-dynasty pharaoh Sesostris I built a series of high obelisks at Heliopolis, including the only remaining structure at the site. Standing at 65 feet and built in the 20th century B.C., it is the oldest surviving obelisk that still stands in its original location—today, a park in the suburbs of northeastern Cairo. Sesostris also built the curious, red-granite Abgig obelisk-stela near the oasis of Al Fayyum (southwest of modern Cairo), which today stands in the middle of a traffic island. Over 42 feet high, it is distinctive for its rounded top, a variation on the traditional pyramidion—although it is believed the symbolism is identical. During the early New Kingdom, beginning in the 16th century B.C. 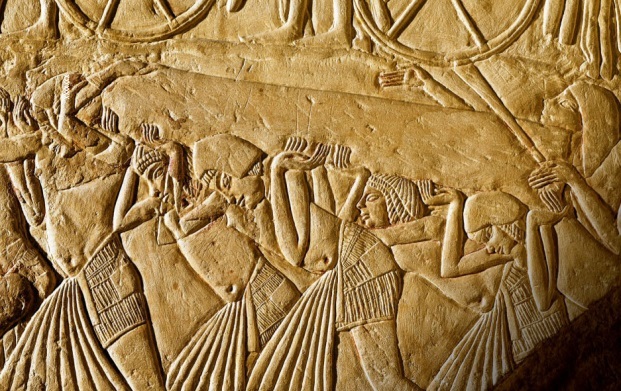 with the 18th dynasty, the importance of the southern city of Thebes grew. It was a center for worship of the god Amun-Ra, who combined the characteristics of Ra and the Theban god, Amun. Obelisks began to be erected in pairs in front of pylons that flanked the gates to temples—a manifestation of the dual aspect of the god Ra as both sun and moon. Thutmose I built a pair of obelisks at the Temple of Amun at Karnak, one of which still stands. His successor, Hatshepsut, also constructed twin obelisks at the temple. One has toppled; the other, at 97 feet high, is the tallest ancient obelisk still standing in Egypt. 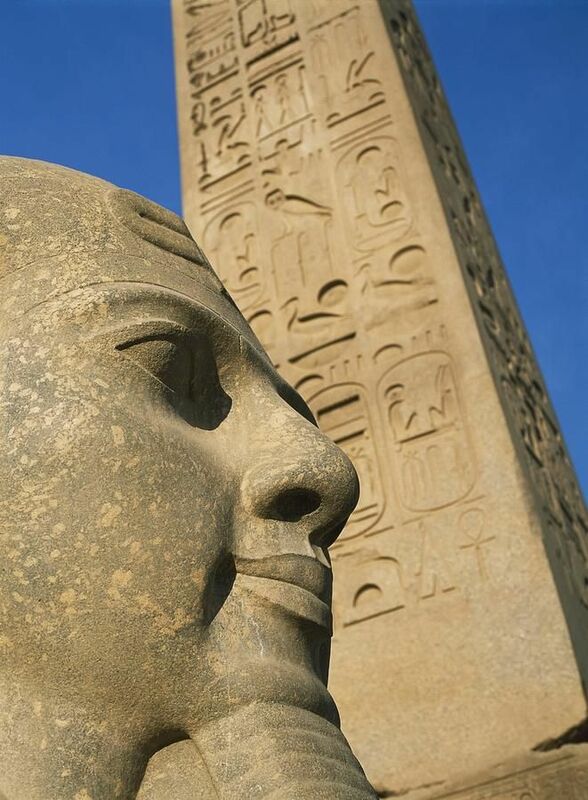 The great warrior pharaoh Thutmose III contributed several obelisks to Karnak, creating the colossal “Lateran Obelisk”, later taken to Rome, where it still stands. Hatshepsut was responsible for the creation of an obelisk that would have been the tallest of all—if her workers had been able to get it out of the ground. 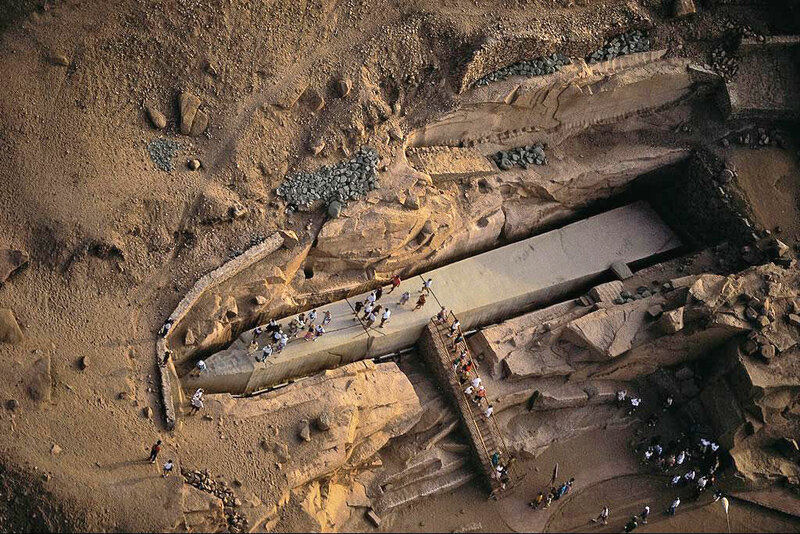 Still lying half-carved out of the rock at an ancient quarry of Aswan, is the “unfinished obelisk,” a monolith that cracked some three-quarters of the way into the painstaking process of being excavated. Scholars believe it to have been commissioned in the 15th century B.C. Had it been completed, it would have stood at 138 feet. Seeing the abandoned obelisk reveals the titanic effort involved in creating these massive stone towers. Once cut from the ground, they needed to be moved. Workers would haul them up ramps, drag them on sleds, transport them by boat, and then, in a procedure fraught with danger, raise them in their final destination. Little wonder that this astonishing outpouring of physical energy, technical ability, and artistic skill was seen to unite heaven with earth, the pharaoh with the gods. In the New Kingdom, in addition to becoming taller and more massive, the structures became ever more elegant. carved out of a more diverse range of materials. including granite. quartzite. limestone. and sandstone. The color of the stone from which the obelisk was carved was also closely linked to the heavens. The most commonly used material was granite from quarries of Aswan. The stone was prized for it reddish or pinkish tones, qualities associated with the sun. Metal components also began to be used as adornment. According to ancient sources. some obelisks. including one of Thutmose III’s, were covered in gold plate or electrum, a gold and silver alloy. It was seen as a fitting material because of its durability and its relationship with the gods, whose flesh was made of gold, according to the Egyptians. The color of gold also had a special connection with the sun, whose light fostered life on Earth. Fascination with Egyptian obelisks is nothing new, and many outsiders were captivated by their majesty. Roman conquerors felt compelled to bring Egypt back to Rome. Augustus brought an obelisk from Heliopolis, a city built in the time of Ramses II. to Rome. 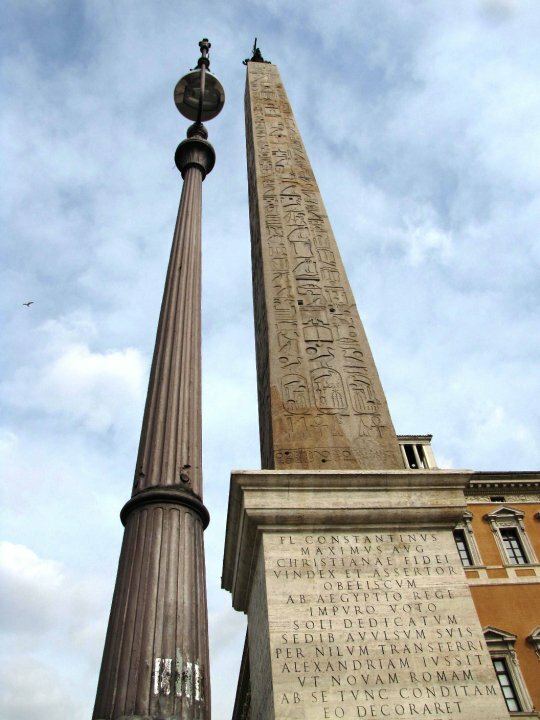 Thutmose III’s gigantic Lateran Obelisk was hauled off to Rome during the reign of Constantius II in the fourth century A.D., and another obelisk of his was shipped north a few decades later by Theodosius I. It was taken to Constantinople, modern-day Istanbul, where it stands to this day. Throughout the ages, outsiders continued to desire these obelisks and moved them far from Egypt. 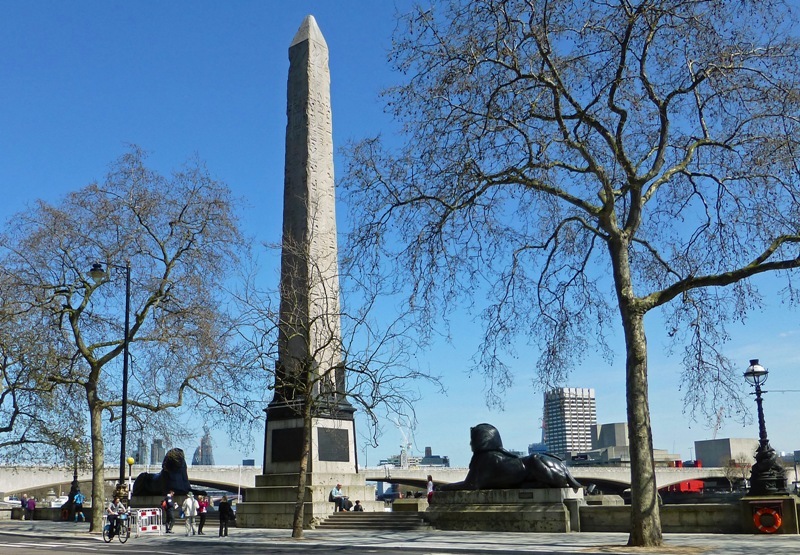 Colonialism, combined with the collusion of Egyptian leaders, resulted in many ending up in parks and squares in the West, such as the so-called Cleopatra’s Needles. Standing in Paris, London, and New York City, these three obelisks have nothing to do with the Ptolemaic queen. The Paris obelisk is one of Ramses II’s from the Luxor temple. Erected in the 1830s, it stands today at the Place de la Concorde. The other two are the twin obelisks of Thutmose III; in the 187os one was sent to London, England, and the other given to the United States. Coveted, flaunted, and imitated, obelisks are timeless reminders of the astounding technological and spiritual feats of ancient Egypt.